But our claim is that our Church is Orthodox, or more simply, the Church, and this is a frightening claim. It implies that it is the faith for all men, for all countries, for all cultures. And unless this implication is kept in mind and heart, our claim to be the true or Orthodox Church becomes hypocrisy, and it would be more honest to call ourselves a society for the perpetuation of the cultural values of a particular geographic region. This is the antimony of our situation; this is where all our difficulties are rooted. Yet unless we understand it, we will always have wrong solutions. These wrong solutions--quite popular today--follow two basic patterns. I will call one pattern a "neurotic" Orthodoxy. It is the attitude of those who, whether they are native Orthodox or converts, decide they cannot be Ortho­dox unless they simply reject American culture, who build their spiritual home in some romantic and idealized Byzantium or Russia, and who constantly curse America and decadent Western society. To them, "Western" and "American" are synonymous with "evil" and "demonic." This extreme position gives a semblance of security. Ultimately, however, it is self-destructive. It is certainly not the attitude of Saint John, who, in the midst of a violent persecution, said so simply, "And this is the victory that has overcome the world--our faith" (1 John 5:4). And further, he said, "There is no fear in love, but perfect love casts out fear, because fear involves torment" (1 John 4:18). In the attitude of some, however, Orthodoxy is transformed into an apocalyptic fear which has always led to sectarianism, hatred, and spiritual death. And who knows whether it may not be the real mission of Orthodoxy in America to change the American culture which has never really been challenged by a different set of values? No doubt Orthodoxy has an understanding of man, life, world, nature, etc., radically different from those prevailing in American culture, but this difference itself is a challenge for Orthodoxy rather than a justification for withdrawal, negativism, and fear. 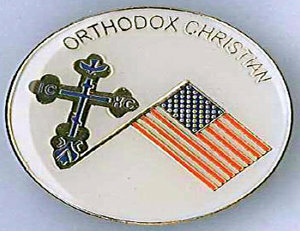 To avoid the two extremes, to be truly Orthodox yet fully American, seems to be the only real Orthodox tradition. Source: From The Mission of Orthodoxy.